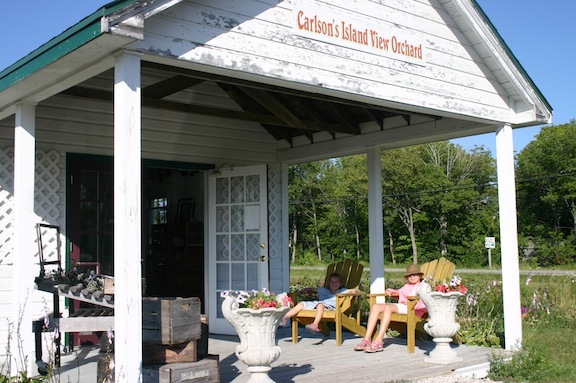 There are no traffic lights in much of Door County, WI. There are hardly any chain restaurants or big box stores. There isn’t even much WIFI. Our favorite local produce farmer. What’s there are endless beaches, hiking trails, countless boats, and five bikes for every one car. And stars. Millions of ’em. There’s nothing like starring up at a starry sky after a fabulous day of biking/hiking/swimming with the family to make me count my blessings. 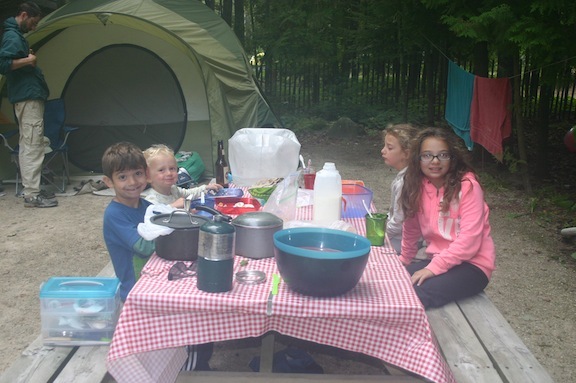 In the quiet of our camping trip (we didn’t even charge our cell phones! ), twice I was moved to tears just thinking about blessings.There are a lot of fabulous vacation options out there, and I’d be thrilled to go on most of them. But, there is something about the simplicity of enjoying the great outdoors with my family that’s both inspiring and powerful. Breakfast by our vacation home. Sure, there are challenges to sleeping in a tent with a family of six, biking 10 miles and hiking up hills with little ones. But, at the end of the trip, when my oldest daughter wondered out loud how she just can’t imagine having been born into any other family–I knew we made the right choice. 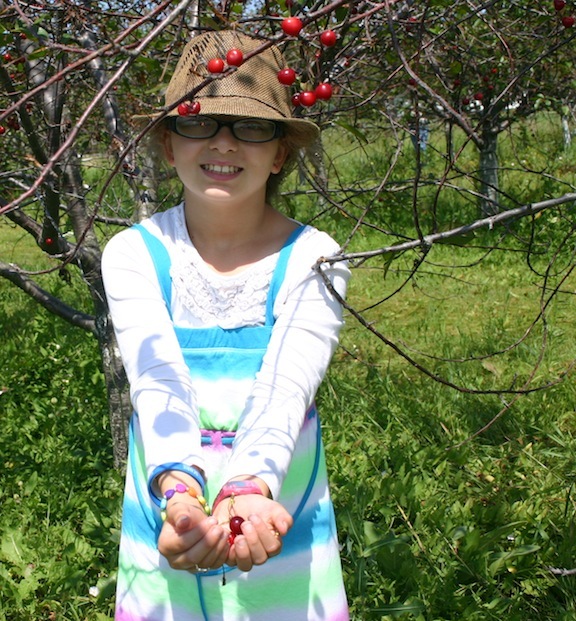 Cherry picking: Door County’s known for cherries, and u-pick farms are everywhere. We pulled over at the first one we saw. Loads and loads of cherries. 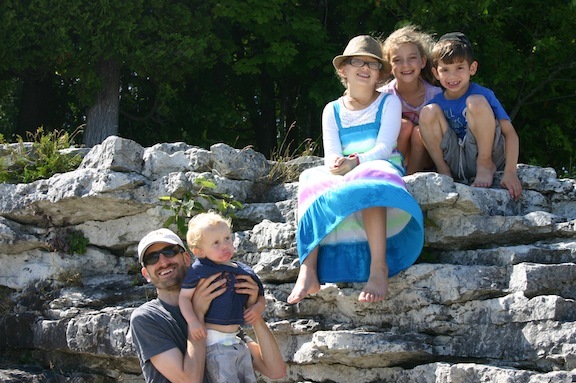 Cave Point County Park: This park is one of our favorites. The hiking is incredible, along limestone cliffs, overlooking Lake Michigan. The landscape features underwater caves and wave-worn cliffs, making this one of nature’s jungle gyms. We climbed down the cliffs to a swimming area, where those who are completely insane prefer to jump from the high cliffs into the turbulent waters. Evening: Though there are activities for entertainment at night in the peninsula, our kids are too young and tired by then. We spent all of our evenings grilling dinner, sitting by the fire and roasting marshmallows. Beach: Any particular spot in Door County is just minutes from the beach, but the one near our campsite was just perfect. The “Sand Beach,” as it’s known, is just as it is called. The shallow water stretched out for more than 100 ft., and the sand felt like silk. 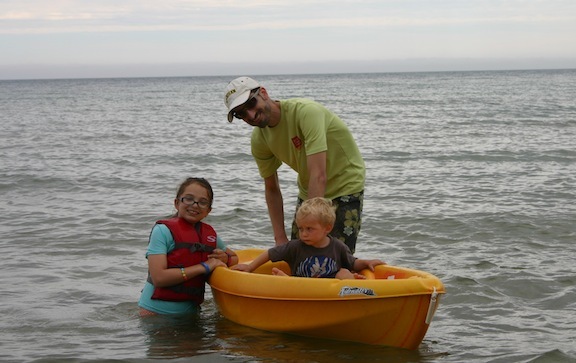 My kids could play in the warm water, far away from the shore and still only be up to their knees in water. 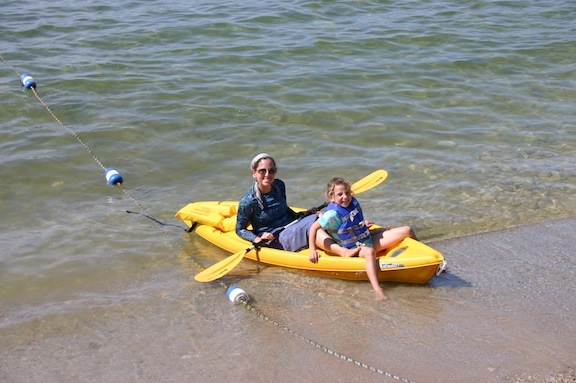 It was shallow enough to let them kayak on their own. On top of that, it was nearly empty. In the afternoon, we took an incredible hike up a bluff and then down to a rock beach, complete with a giant teepee built by visitors from wood that washed up on shore and hundreds of man-made rock statues. We headed into town to buy produce from a local farmer and play in a park by the beach. It was only in the 60s that day, which by the water is pretty darn cold. In the evening, we went out to a high bluff over the Bay to see the sunset. 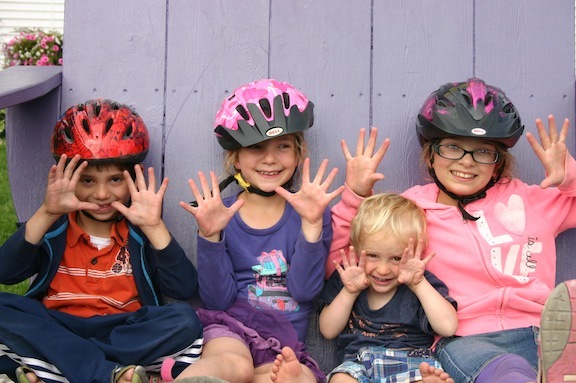 Biking: Biking 10 miles in Door County by age 6 is a sort of an initiation in our family. This year was our son’s turn to conquer Peninsula State Park on a path that includes a number of big hills. 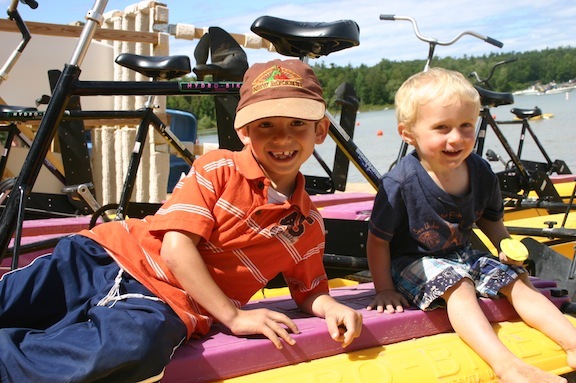 We bike in 5 miles, then picnic, swim and go boating at the beach. The ride back to the car is another 5 miles around the loop. This is before the 5 miles back to the car…when he was still smiling! While biking with kids can mean a lot of whining and even crying, it is well worth it. There are few other activities where our kids, under supervision, are entirely responsible for themselves. When I have my own bike to lug up the hill or through the sand, each kid is on her own. That meant my son cried a few times and even threw his bike to the ground halfway up a hill, but he made it. And he’s still talking about it. We headed back to Sister Bay to swim by the pier and kayak in the Bay. I took each of my girls out for an hour ride, and they did a lot of the paddling. The girls also took our annual trip to the beading store to buy materials for necklaces while the boys went bowling. Our small but mighty kayak. 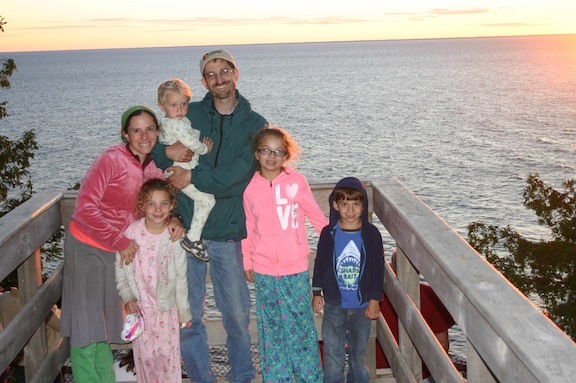 We packed up and drove to Lake Geneva to spend Shabbos and Sunday with family–indoors. Sounds like such a lovely trip! 🙂 Missing your family!